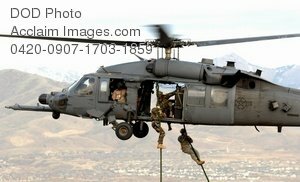 Description: Free, public domain image: Soldiers Being Lifted on Board an HH-60 Pave Hawk Helicopter During Training. A Utah National Guard Soldier and 19th Special Forces member are lifted on board an HH-60 Pave Hawk during a combat search and rescue integration exercise Nov. 9 over the Utah Test and Training Range. Members of the 34th Weapons Squadron from Nellis AFB led the search and recovery training. The exercise expanded the integration with Utah's 211th Aviation Group AH-64 Apache Joint Rotary Wing, 4th Fighter Squadron F-16 Fighting Falcon assets from Hill AFB, Utah, and special operations forces. Exercise participants also conducted extensive joint combat search and rescue operations against surface-to-air threats. The exercise is being run held Nov. 6 through 15. (U.S. Air Force photo/Master Sgt. Kevin J. Gruenwald.